Dodge Magnum Pros and Cons | Page 1 of 2 | Why Not This Car? What drives people to buy (or not buy) a certain car? 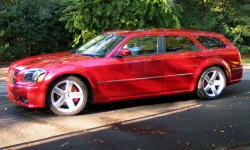 TrueDelta's members share Dodge Magnum pros and cons based on their real-world driving experiences. One of a kind. Only car that looks that way. Rear wheel drive. Long wheelbase. This car has a very connected feel to the road, and puts a smile on your face everytime behind the wheel. One of the strongest looking wagons ever, great style and cousin of the beautiful 300c. This thing flies! Pure smooth American power all the way to 170+ MPH! Trans shifts great, too! The V6 accelerates like a V8: plenty of power around town or on the highway. Autostick is useful when descending hills to go down to 4th or 3rd gear. Black on black. No chrome, other than the Dodge badge. All other badges were shaved. The stance is fantastic. Looks incredible from any angle. Too aggressive. Makes high drag coefficient. Sloping rear roof line kills rear vision. very nice looking...many comments from people. The best interpretation of a station wagon to date. If not for this car, a station wagon would not have been on my list when I started looking. Does not look like everybodys car. The amount of room to fit two tall adults with two children. Ease of use to put a stroller in the back of the car. awd, traction control, stability control, brake assist, anti-lock brakes, sunroof correctly sized and placed and adjustable pedals.